Science Channel has turned the escape room trend into an exciting and fun hour long game show. Every now and then a hidden gem comes along on some distant cable channel and wows us. 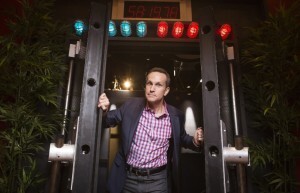 Science Channel brings us this new under-the-radar game, Race to Escape, hosted by Jimmy Pardo. If you’ve got a free hour sometime today I cannot recommend watching it enough. It’s really, really good. You can click here to watch the first episode or check it out Wednesdays, Fridays, and Saturdays at 10:00PM ET. Each episode locks two teams of three into two identical rooms (except for the team colors, one red and one blue). They have $25,000 up for grabs and one goal: be the first to get out. The teams have an hour to solve five different puzzles, each revealing a four digit combination that can be entered on a touch pad. The first team to unlock all five combinations gets out and wins the money. Time is money, though. After the first 20 minutes the teams will lose $500 per minute. To keep it competitive in case one team gets stuck behind, each team gets three Code Breakers which essentially helps the team solve the puzzle at a cost of $5,000. A Code Breaker can be used five minutes after the first clue for the puzzle is revealed and cannot be used on the fifth and final puzzle. It takes a big $5,000 out of the team’s bank but could be the only option to keep them in the game. The entire product of Race to Escape is just fantastic. These types of shows are notoriously hard to inject any level of play-along value but they manage to do it extremely well. Instead of just watching most games you’ll be guessing along, trying to remember what you’ve seen in the room, and screaming answers out at your screen. Games are tricky but not impossible and, most importantly, have that “ahh” moment when after you realize it you wonder how you missed it the first time. Tricky but solvable is what’s important in this stuff and they do it well. The actual presentation is impressive. If you remember the excellent Fox Reality Channel show Solitary, you get the same sort of vibe from this. It’s a mix between intense and lighthearted. You can have a laugh while your heart is racing. A lot of this is thanks to host Jimmy Pardo who keeps the game moving and does a great job giving the show a fun and interesting feel. Uniquely (and wisely) they give a good amount of science background and terminology regarding what the teams are going through so you get entertained and educated at the same time. There’s little to not like in Race to Escape. It’s fast, fun, and tense. You get a laugh, you learn a bit, and you feel like you’ve accomplished something once you get through the puzzles. It doesn’t feel like it drags and it keeps its excitement and momentum through the entire show. It’s that rare cable competition/game show that you wish all other games on TV could strive to be. Watch Race to Escape on Science Channel. Check the website for the schedule. Race to Escape manages to turn an escape room game into an incredibly fun, tense, and enjoyable hour.